wah...malam2 baru nak hapdet ye love...cikmin dah nak tido ni pun terasa lapo la love..td baru lepas makan nasik lemak bentong...huhuhu..
Hello Love, noticed your 'Love' at Wateirman's place and busybody over. This dish looks not only interesting but delicious. 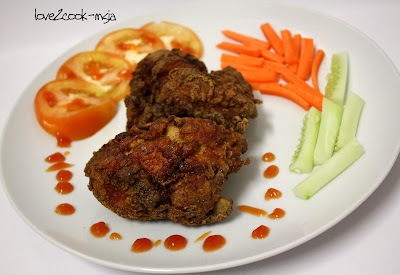 Have always loved fried chicken....though I've never heard of the name, till now. 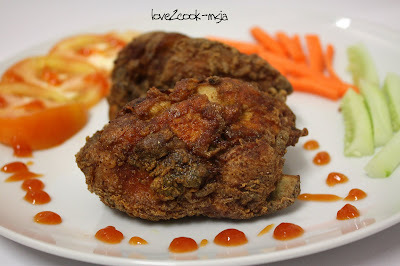 Ijan --> Ur recipe is sure to try! Tension takde cornflour mlm tadi. Hehe, it's my fault..shld hv checked it! I've noticed ur name at KakWatie's blog too. Yeah, Fried Chicken is everyone's favourite. It's a Must-Have dish in my home. Hehe. Anyways, tks alot for ur compliments, really appreciate ur visit here! :) U too have a great day ahead. You take care...keep eating a piece of chicken every meal time...will keep the stomach from singging!!! LOVE...you have so many ideas! that's what i respect about people who love to cook like you. Hihi, camera Hubby nih...byk berjasa dah kat Love, sayang sangat!!! Hihi, We dun eat chicken everyday...maybe alternate days! Hahaha! ;) Sure U take care too!